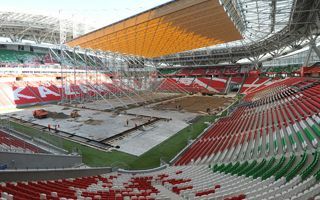 Kazan Arena is one of the stadiums regional authorities were planning even before FIFA gave them hosting rights for the 2018 World Cup. The stadium was built with opening/closing of the 2013 Universiade in mind, although obviously Rubin were always seen as key tenants. After all, the Premier Liga side gained some European recognition and became one of few leading sides outside of Moscow. The Premier Liga alone means 15 large scale events per year, not including the Russian Cup and European campaigns. Quite frankly: they’re the only tenant who can provide sustainable long-term use for the Arena. Yet from the very start it seems Rubin hardly means anything to local authorities and stadium operations team. Instead of some 40 events, the team only played 8 league games and one Russian Cup fixture here. First, the much-delayed construction site wasn’t handed over until the 2013 Universiade. There was really no point in laying the field as large central stage had to be constructed. As if a half-year long delay wasn’t enough, Kazan Arena was then closed for Rubin’s players and fans for one whole year after the closing ceremony! First, all temporary infrastructure had to be removed, construction actually finished and then one more reason for not letting the team play was… care for the state of the field. This time football had to make way for swimming. And though the FINA World Championship doesn’t begin until August 2015, Rubin had to leave already in December 2014. Then after two weeks of swimming events in front of less than half capacity it’s half a year more without any game, until March 2016. Rubin will return to their new stadium when it actually turns 3 years old. And even that is based on condition that the re-laid €200,000 new field is in good condition in March 2016. It has to be re-laid, because currently a 2.2m-deep swimming pool is being built on one side and a massive temporary grandstand on the other. One cannot agree that holding large events like the Universiade and FINA World Championships is of great importance and established Kazan as a major city in Russia and beyond. That said, it’s absurd for the main stadium to be closed for a year before/after each event. It may turn out that in the long term the stadium won’t benefit much from these events, if at all. Once the prestige is gone, it’s back to Rubin and their fans. And at this point they seem disillusioned. Matchday revenue would hardly be impressive in the first few seasons. But those best months for the stadium (when people would be drawn to the arena itself if not for mediocre league football) are now lost. But if it was hard to fill the stadium in its first half year, it will now be much harder to bring people back and build sustainable growth beyond the 46% occupancy it had. Actually, it may be difficult to get back to that point again. Just for reference: after getting back to the Central Stadium in recent weeks, Rubin only once managed to get over 5,000 people to a game despite again competing for a European-cup spot!